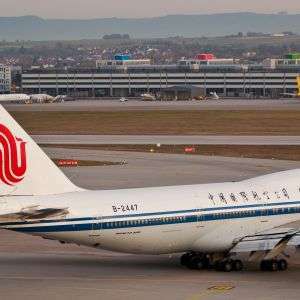 Air China is historically the worst of the big Chinese airlines for safety; however I am too poor to fly business class, so it is difficult to compare specific service levels. I have flown cattle class with China Southern many times, both international and internal and not had any difficulty talking to any of the crew; the standards of English were very good, and on the international flights, the entertainment choices seem to be much wider than the linked review. The 777 is also my least favourite aircraft for longhaul; I find them very noisy, cramped, and jittery in the air compared to the Airbus equivalents, and I will go out of my way to get an Airbus 330 or 340 if I can. If you can bag a flight with an A380, you are in heaven; even in cattle class, the flights are so smooth, but routes are limited and prices usually a lot higher. China Southern Airlines are worth a look too; I flew them to Auckland a year or so back and was impressed with their service and they were incredibly cheap. The 787 Dreamliner was probably the best aircraft I have been on too. If it helps, Air China now have flights from Gatwick to/via Chengdu on their newer A330. Looking at thier prices, it's often cheaper to fly on from China to another destination. Maybe a stopover in China would be cheaper. Don't forget you can get a 72/144 hour visa free travel to China, depending on where you enter the country. Agree about China Southern and the 787. Wasn't expecting much but the higher cabin pressure really helps. I'd choose Dreamliner over any other just for that, if it was available on the route of course..
China Southern Airlines are worth a look too; I flew them to Auckland a …China Southern Airlines are worth a look too; I flew them to Auckland a year or so back and was impressed with their service and they were incredibly cheap. The 787 Dreamliner was probably the best aircraft I have been on too. Dont book through their own booking system. I got my most recent cheap CS flights via the KLM website, having been directed there by a cheap KLM ticket offer on Kayak. KLM were selling the CS tickets for £340, CS website wanted £780 for the same seats. The tickets I bought never showed as an option on Kayak. Horrible airline and going through Chinese airport security is a violating experience. never again air china. worst experience ever. I don’t understand why these Chinese airlines are never cheap to fly to China! I don’t understand why these Chinese airlines are never cheap to fly to C …I don’t understand why these Chinese airlines are never cheap to fly to China! The Chinese airlines dont do sales; if you want a cheap flight, the 3rd part sellers are where you find them; China Southern is often among the cheapest* when flying into many mainland Chinese airports when you search on most flight search websites. My go to is Kayak; although in the past Cheaptickets and its clones used to offer slightly lower prices, in recent years they have become quite expensive. Skyscanners and Opodo are the other two sites I regularly check. The sweet-spot for buying is 8-12 weeks before the date, either side of this the prices get increasingly higher most of the time, although you can luck out on a last minute deal sometimes - I got Emirate tickets relatively cheap for a flight out of Hong Kong - booked 72 hours before departure. In recent years, the VERY cheapest have been Xiamin Air, but they nearly all include a VERY* long stop-over at Xiamin city's airport - which is a pretty grotty place according to every review I have read. *Across the date range I was looking for, the Xiamin Air stop-over was 14-18 hours each way. 1. One of the worst airlines in terms of hospitality/service by the cabin crew. Probably if you speak Chinese, you would have a slightly better experience. 2. The transit in Beijing or Shanghai (or at any Chinese airport) is the worst ever in terms of a smooth process. You have to get in a queue (often very long) wait for your passport to be stamped for exit, pick up your bags that you had checked-in at London, put those bags to be cleared on a scanner & exit the arrivals, and check-in again along with your bags for your next flight. Now, would you call that a transit?! Do yourself a favour and keep away from Air China! The Chinese airlines dont do sales; if you want a cheap flight, the 3rd …The Chinese airlines dont do sales; if you want a cheap flight, the 3rd part sellers are where you find them; China Southern is often among the cheapest* when flying into many mainland Chinese airports when you search on most flight search websites.My go to is Kayak; although in the past Cheaptickets and its clones used to offer slightly lower prices, in recent years they have become quite expensive.Skyscanners and Opodo are the other two sites I regularly check.The sweet-spot for buying is 8-12 weeks before the date, either side of this the prices get increasingly higher most of the time, although you can luck out on a last minute deal sometimes - I got Emirate tickets relatively cheap for a flight out of Hong Kong - booked 72 hours before departure.In recent years, the VERY cheapest have been Xiamin Air, but they nearly all include a VERY* long stop-over at Xiamin city's airport - which is a pretty grotty place according to every review I have read. *Across the date range I was looking for, the Xiamin Air stop-over was 14-18 hours each way. Good tips mate. Thanks for that! I am Chinese, and fly back to China once a year or so. Where I fly to — Guangzhou is the base of Southern China airline, But all these years I have never taken Southern China for once while I usually go for the cheapest deal. This actually bothers me quite a bit. A friend flew with them to elsewhere in China and stopover in Guangzhou, she got the ticket for around £400. I was planning to get on the same plane with her in her first flight to Guangzhou, but as long as Guangzhou is your final destination, the price is over £1000. I think that’s crazy. I am currently looking for a ticket for my 15 year old girl to go back on her own for the first time this summer, so ideally I would like her to fly directly to Guangzhou, but all the websites I have been looking quoted me over £1000 which is a bit much, comparing like Fin Air you could fly under £500 there with stopover in Helsinki. Ahhhhh! Not easy! Any recommendations? Good tips mate. Thanks for that!I am Chinese, and fly back to China once a …Good tips mate. Thanks for that!I am Chinese, and fly back to China once a year or so. Where I fly to — Guangzhou is the base of Southern China airline, But all these years I have never taken Southern China for once while I usually go for the cheapest deal. This actually bothers me quite a bit. A friend flew with them to elsewhere in China and stopover in Guangzhou, she got the ticket for around £400. I was planning to get on the same plane with her in her first flight to Guangzhou, but as long as Guangzhou is your final destination, the price is over £1000. I think that’s crazy.I am currently looking for a ticket for my 15 year old girl to go back on her own for the first time this summer, so ideally I would like her to fly directly to Guangzhou, but all the websites I have been looking quoted me over £1000 which is a bit much, comparing like Fin Air you could fly under £500 there with stopover in Helsinki. Ahhhhh! Not easy! Any recommendations? All airlines discount flights that pass through their home airport(s). All airports charge a landing fee on passengers that finish their flight at that airport - the bigger the airport, the bigger the fee they can get away with. If you need to finish at a major airport like Bayun, you need to book a flight that goes through the Hub of another airline in the same Airline group; CS is part of Skyways, so KLM, Lufthansa and a few others all code share aircraft, this pretty much cancels out the higher landing fee; and if you can carry on to a smaller regional airport, it gets even cheaper. We usually book KLM/CS, so we fly to Amsterdam transfer to the Guangzhou flight (or Singapore or (Hong Kong), then on to Nanning; that way we get the KLM Home airport discount even if the onward flight is a CS plane. Other tips, Wednesday is often the cheapest day of the week to fly, also Friday 13th, but they dont come around as often. KAYAK have an option to display the cheapest flights +/- 3 days either side of the departure and return date you want. Using this can be the difference between paying £1000 and paying £300 for the exact same flight - but on different days. A lot of Chinese I know use Air France, as there is a deal some Chinese travel agents* get that gives them the increased Economy Plus baggage allowance without paying the Economy Plus ticket price; however, transiting through Charles De Gaul airport can be a nightmare, and AF are notorious for losing your luggage. (lost it both times I've used them). *Locally, the agent is the one next to WinYip in Birmingham. Best time to book is 12-8 weeks before you want to go, this is when the prices seem to be at their lowest most of the time. All airlines discount flights that pass through their home airport(s).All …All airlines discount flights that pass through their home airport(s).All airports charge a landing fee on passengers that finish their flight at that airport - the bigger the airport, the bigger the fee they can get away with.If you need to finish at a major airport like Bayun, you need to book a flight that goes through the Hub of another airline in the same Airline group; CS is part of Skyways, so KLM, Lufthansa and a few others all code share aircraft, this pretty much cancels out the higher landing fee; and if you can carry on to a smaller regional airport, it gets even cheaper.We usually book KLM/CS, so we fly to Amsterdam transfer to the Guangzhou flight (or Singapore or (Hong Kong), then on to Nanning; that way we get the KLM Home airport discount even if the onward flight is a CS plane.Other tips, Wednesday is often the cheapest day of the week to fly, also Friday 13th, but they dont come around as often.KAYAK have an option to display the cheapest flights +/- 3 days either side of the departure and return date you want. Using this can be the difference between paying £1000 and paying £300 for the exact same flight - but on different days.A lot of Chinese I know use Air France, as there is a deal some Chinese travel agents* get that gives them the increased Economy Plus baggage allowance without paying the Economy Plus ticket price; however, transiting through Charles De Gaul airport can be a nightmare, and AF are notorious for losing your luggage. (lost it both times I've used them). *Locally, the agent is the one next to WinYip in Birmingham.Best time to book is 12-8 weeks before you want to go, this is when the prices seem to be at their lowest most of the time.I hope this helps. Wow! Amazing tips!’ That’s why I love Hot UK Deals but love the people here much more!!!! Air China is historically the worst of the big Chinese airlines for …Air China is historically the worst of the big Chinese airlines for safety; however I am too poor to fly business class, so it is difficult to compare specific service levels.I have flown AC and China Eastern internal flights a few times, and AC aircraft always seemed a bit worn in comparisonI have flown cattle class with China Southern many times, both international and internal and not had any difficulty talking to any of the crew; the standards of English were very good, and on the international flights, the entertainment choices seem to be much wider than the linked review.The 777 is also my least favourite aircraft for longhaul; I find them very noisy, cramped, and jittery in the air compared to the Airbus equivalents, and I will go out of my way to get an Airbus 330 or 340 if I can.If you can bag a flight with an A380, you are in heaven; even in cattle class, the flights are so smooth, but routes are limited and prices usually a lot higher. Hmm, it does appear I have the names crossed. Not sure you are correct on safety though, although the current safety ratings for all of them are 7 stars, but it was the Chinese government owned one that was suffering a lot of crashes due to poor maintenance. I have flown the Mainland China one in recent years, and the aircraft were older and looked more worn than the other big carriers; my last visit had us on several China Southern flights - which were on modern, Chinese built and part Chinese designed aircraft which were much nicer than the ancient 727/737s others were using on previous trips, and with TONNES of legroom (I am 2m and had 3-4" gap between my knees and the back of the next seat, in a middle of the section row. Yes, I forget which one, but one of them was on a 727; it was so old, I swear the evac data sheet was in Atic Greek.